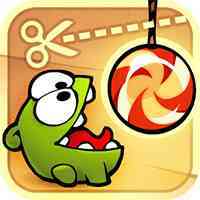 Cut the rope to feed candy to Om Nom®! 600 million downloads around the world of this phenomenal puzzle game. 425 levels of sweet fun! A mysterious package has arrived, and the little monster inside has only one request… CANDY! Collect gold stars, discover hidden prizes and unlock exciting new levels in this addictively fun, award-winning, physics-based game!